As Outreach Coordinator, Alesha manages Old First’s community service programs, including the winter shelter and the urban service camps. At Old First, we take seriously the call to “love our neighbor as ourselves.” we dedicate ourselves to building relationships and standing in solidarity with people in need. We have learned that when we serve others we gain much more than we give. Learn more about the ways Old First gives back to our neighborhood and beyond by checking our serve page. Our Outreach initiatives run from direct service at our Saturday Breakfast program and Winter Shelter to advocacy efforts with POWER. Everyone, regardless of religious or spiritual tradition, is invited to join us in the act of loving our neighbors and our neighborhood. 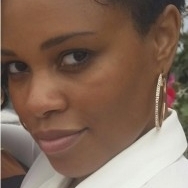 Alesha holds a bachelor's degree in Africana studies from Temple University. Prior to joining Old First she worked in event planning, office management and fundraising for the American Cancer Society. (When not at Old First) I work as a freelance writer and interviewer.